Jewish students find out in Chicago that Jew bashing is popular –and tolerated–again. H/T Kyle Olsen at EAG News A Chicago school is in turmoil, the principal has been reassigned and two Jewish students are afraid after a spate of anti Jewish bashing. The challenges surrounded allegations from Ogden parent Lisa Wolf Clemente that her 14-year-old and 8-year-old sons were bullied at both campuses by classmates for their Jewish heritage. The Gold Coast resident said her teen son was shown photos of ovens and told to get in during lunch periods, intended as a reference to the Holocaust. At the Streeterville campus, Wolf Clemente said her 8-year-old was invited to join a team called “Jew Incinerator” on the popular game app Clash of Clans. The team was allegedly created by Ogden eighth-graders. The mother of the two kids, Lisa Clemente, said her 14-year-old son was bullied during lunch and Spanish class by students who showed him pictures of ovens and told him to get in. This incident happened right after a trip to the Holocaust Museum (story here). “Call it its name. They were racist, they were being anti-Semitic to my son,” said Lisa Wolf Clemente outside Ogden Thursday afternoon, hours after eighth-graders went on a field trip to the Holocaust museum in Skokie. Afterward, “not one person addressed the correlation between the Holocaust museum and my son,” she said, adding that they missed the chance for a teachable moment. Clemente says she was asked to turn the other cheek when the bullying first started, but by the time her eight year old was asked to join a gaming team named the “Jew Incinerators” her patience had worn thin. She asked the principal to act and when he didn’t get tough enough, mounted an online effort to get him fired. He was transferred instead. So far there’s no word on whether there will be hate crime charges brought against the youths. I don’t like hate crimes legislation, but it’s fun to see the people who are usually so ‘offended’ by real or imagined ‘hate crimes’ suddenly employ pretzel logic to ignore hate when it’s right in front of their faces–but happening to a less sympathetic group of people. A woman’s Palm Springs condo is like a twisted Hotel California, she can check him in, but he’ll never leave. Airbnb (Air Bed and Breakfast) is a great idea. You rent out your property and make a little money on it while it’s not being used. I’ve successfully used a similar service–FlipKey–for a foreign vacation a few years ago and I briefly considered using Airbnb to occupy our unsold house. A neighbor was using the service and I thought, why not? Now I’m glad I didn’t have to confront that eventuality. In this story, the ‘tenant’ knew how to game the system and took advantage of the condo owner, Cory Tshogl. It will now be put on the list of landlord’s worst nightmares. The guest booked the space for 44 days from May 25 to July 8 and paid for the first month in advance through Airbnb. After 30 days, Airbnb notified Tschogl that its attempts to collect the balance due “did not succeed” without specifying why. Cory Tschogl says she knew something was amiss when the guest who goes by the name “Maksym” complained that the tap water was cloudy and he didn’t like the gated entry to the complex. Tschogl had a bad feeling so she agreed to his request for a full refund for the 30 days he had paid in advance. But then the guest changed his mind and decided to stay, Tschogl tells the Chronicle. The man refused to pay the remaining balance due, however, and he refused to leave. Tschogl decided to let him stay for the full 44 days. But the renter still wouldn’t leave, so Tschogl threatened to turn off the power. His response: He was legally entitled to stay in the condo, and the loss of electricity would threaten his at-home work, which pays up to $7,000 a day, the Chronicle says. He also said his brother visited and became ill from the tap water. Tschogl realized that she couldn’t legally cut off the electricity, although her SoCal Edison account showed daily usage was triple to quadruple normal. Her father went by the unit several times and photographed it with the sliding glass doors and windows wide open, presumably while the air conditioning was going full blast to combat the 114-degree heat. She had an even bigger beef with Airbnb for its failure to help her. The start up has since stepped up and helped her defray her legal bills which will undoubtedly be enormous. She’ll have to evict him. I wonder if she’ll ever use Airbnb again? Comic-Con Zombies attack car in San Diego, woman hurt by fleeing driver. 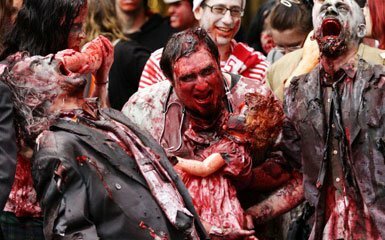 The annual Zombie Walk at the annual Comic-Con turned ugly over the weekend when some attacked a car, shattering the windshield, and the driver, with his freaked out kids in the back, hit a woman in his getaway. This News6 reporter talked to the guy who crushed the windshield and explains he did it to stop the car from going into the crowd. The driver of the car is not expected to be charged. While chanting anti Israel genocide chants (see post here), Pro Palestine protesters over the weekend were also engaging in a little of giggle (and fake tears) inducing Pallywood. See Laughing at Liberals other videos here. Portland Palestine protesters chant for Jewish genocide. Will Portland’s Office of Equity and Human Rights investigate? Protesters on the streets of Portland chanted for genocide of Jews. If you don’t believe me, just look at the map nearby. 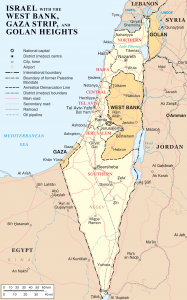 The Jordan River establishes Israel’s border on the east, while its western border is the Mediterranean Sea. And here’s the truth: Protesters were chanting on the streets of Portland to not only get rid of Israel–but the Jewish people. There is no other way to understand this. None. This was not a chant blithely tossed off by thoughtless dilettantes. This chant was no mistake. These protesters may be useful idiots, but even trained seals can understand this. See, according to its own charter, Hamas will not abide anyone but believers in Islam on its land. In radical Islam you either forswear your own faith and convert, pay a devastating fine, or die. That means no Jews in Palestine. It has been ever thus. Can you imagine polite society standing mute amid chants of people calling for the annihilation of an entire people group? In what other arena is it acceptable behavior to call for genocide? Even the Westboro nutters don’t go that far, and for their religious quackery, they are rightly shunned by polite society. Even the Westboro nutters don’t go that far, and for their religious quackery, they are rightly shunned by polite society. Though I don’t believe in speech codes and think the so called Office of Equity in Portland is a colossal waste of money, as long as there is one in existence, Jews and friends of Israel everywhere should call on this office to publicly shame and out this group of radicals for what they are: anti semites, racists and believers in genocide. They and their outpost at Portland State University should be booed off the public stage. IRS SCANDAL UPDATE: HARD COPIES of some ‘missing’ Lois Lerner emails. You must credit and link VictoriaTaft.com for use of this material. 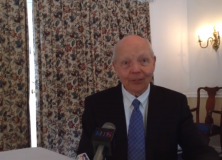 The man now stuck with the IRS Scandal, John Koskinen. The latest in the IRS scandal is that the ‘missing’ Lois Lerner emails may have had hard copy back ups. These are among the same emails that existed and would be sent to Congress, ‘lost’ on a ‘crashed hard drive’, then morphed into a ‘recycled hard drive’ which then magically became an only ‘scratched hard drive’ which then became salvageable (again), have now become printed emails. 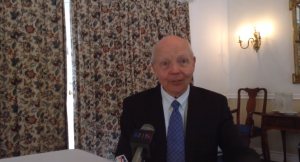 John Koskinen was in San Diego July 15th to keynote a meeting of tax preparers at the Town and Country Hotel. After his speech he sat down with reporters. Most of them left before he said, in answer to one of my questions, some of Lois Lerner’s 24,000 missing emails were backed up on HARD COPY, if they pertained to a particular case. According to Koskinen, those emails should be included in the files of conservative groups. I would add, if they’re not included, the IRS has some more ‘splainin’ to do. Do I really need to add that it’s tough to know what the IRS does or doesn’t have since it keeps changing the story? Judicial Watch has done more to get information out of the IRS than any other group. I asked Koskinen about Judicial Watch’s claim conservative groups are still being suppressed by the IRS targeting. He said that isn’t true. Koskinen said the IRS plans to change its rules, but the IRS only sought to codify the tactics Lois Lerner was using to ice out conservative groups. Koskinen told me some liberal groups were kept out, too. I asked him how many. He couldn’t answer. And get ready, Congress, Mr. Koskinen is teeing you up for blame in the scandal. You must credit and link VICTORIATAFT.COM for using of this material. Feeling the heat, NYC cupcake makers delete racist tweet, keep another. NYC cup cake maker tweets about “zionist pigs.” Bankruptcy to follow? And the reaction to this tweet? Devastating.
.@CupcakeCrewNYC Whoa, you guys make delicious treats AND overblown statements comparing something to Hitler? What CAN'T you do? @CupcakeCrewNYC @instapundit The Nazis gave Jews lots of land and billions of dollars then did basically nothing when the Jews shot rockets?
. @CupcakeCrewNYC That's deep. I'll bet the Jews are the reason your business is failing, too, right? Illegal Alien Central Americans: Where are they now? 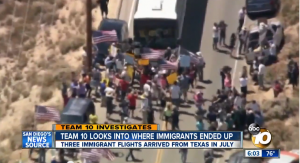 10News in San Diego tried to track back where the border crashers have gone. 54% no show rate in court. 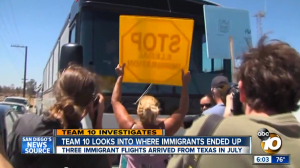 Protesters stop buses from dropping off Central American illegal aliens in Murrieta, California. A follow up report on where the illegal aliens headed to San Diego ended up concludes most of them were given trips to New York, Connecticut and other places with large numbers of Central Americans to, er, stay. “Very few” are still in the San Diego area according to a Rabbi who spoke with 10News. Considering we don’t know how many were here in the first place, that assertion gives little comfort to those who take seriously the issue of border security and sovereignty. The Rabbi told Michael Chen all of the families she oversaw will make it to their follow up court dates but, so far, the rough tally for those who actually show up is 54%. That beats the 70% no-show rate for those in Texas. Escondido Planning Commission says ‘no’ for second time to shelter for Central American children who crashed the border. Appeal is expected. The ACLU organized a rally before the meeting. 10News reports the protesters may appeal the decision to the Escondido City Council. 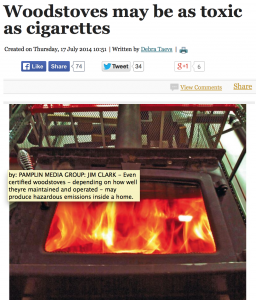 Environmentalists have begun a new and unsavory comparison of fires to smoking cigarettes. It’s an attempt to make it easier to draw an equivalence between things that you enjoy but that may be bad for you and things you need–such as warmth. And then make it all about us. Environmentalist Debra Taevs writes a environmental whopper for the Portland Tribune. And the upshot? When you’re done destroying your neighbors’ lungs with your evil fire, you’ll be responsible for destroying the planet. Environmentalist Debra Taevs writes in this Portland Tribune Op Ed,: if you burn wood you create GLOBAL WARMING!!! The United Nations ranks wood fires the second-leading cause of global warming. But there are the countless environies I believe are important to put her claims into some context. The earth has been cooling, not warming. Environmentalists don’t want to harvest timber, but support forest fires. Environmentalists don’t like CO2 but those same forest fires release the CO2 the trees have been retaining. Environmentalists block efforts to take advantage of cleaner energy such as LNG and fracking while trying to wipe out coal which accounts for 40%+ of the source of US electricity. Environmentalists’ moves raise the price of energy for everyone but those who want to save money by burning wood now are told they’re as bad as evil smokers. In fact, things are so ridiculous, California now puts a warning label, similar to those for cigarettes, on bundles of wood. Taevs, who works for an organization which gets its funding from the City of Portland, states of Washington and Oregon, and any manner of enviro groups, allows that fire’s important and stuff but, hey, we’re beyond all that. Think about that. We’re on the road to criminalizing, or at the very least, making socially unacceptable, behavior that helps our own health and could save our lives–i.e. keeping us warm. That reminds me of the story from San Diego from the other day. A man was arrested for attempted murder in Mission Beach. He ordered a woman to stop smoking and when she didn’t, he took out a knife, stabbed in her in the chest and then tried strangling her. He was affronted by her audacity to smoke and pollute his air and possibly kill him. So he tried to kill her. Sure, the dude was nuts, but where did he get the idea that it was somehow socially acceptable to assault a woman who was merely smoking? Non smokers are given social cues they’re morally superior. That mind set is affirmed by government PSA’s and the first lady! Add that to all the junk science claims about smoke killing our planet without hearing other mitigating factors to put things into context such as volcanoes and forest fires doing more to alter climate than anything man does and you’ve got some undereducated people. Now they’re ladling on the stupid! California is already encouraging people to snitch on neighbors about water use. Soon we’ll have fire wars: neighbor versus neighbor. And those going after neighbors for fire will feel morally superior because, after all, all they’re trying to do is save the planet no matter if that leaves you in the cold. Two rulings, one day. 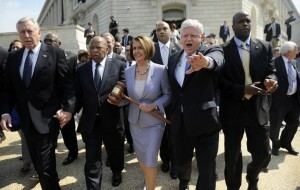 ObamaCare to head to the Supremes. Again. ObamaCare says what it says. That’s what a three judge panel in the DC circuit court of appeals has basically said as much in a ruling today. In a two-to-one ruling, the judges said the ObamaCare subsidy doesn’t apply to people who sign up on the federal health insurance exchanges, only state exchanges because that’s what the law says. The federal government says it will ask the full first circuit to review the case. In the meantime, people who signed up with the federal government and qualified for subsidies, including those in the failed state plans in Oregon and Maryland, are wondering what will become of their free money. 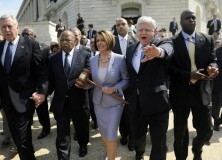 Although the president has changed the law multiple times to suit his political aims and the IRS attempted to paper over this obvious issue, the Democrats, when they did the final cram down on ObamaCare, intended for there to be no subsidies paid at the federal level–hoping to force states to do it. A federal appeals court on Tuesday struck down one of the pillars of ObamaCare, ruling that the law’s premium subsidies are invalid in more than two-dozen states. The D.C. Circuit Court of Appeals said in a 2-1 decision that the Affordable Care Act (ACA) does not permit the IRS to distribute premium subsidies in the federal ObamaCare exchange, meaning those consumers must bear the full cost of their insurance. “Because we conclude that the ACA unambiguously restricts the section 36B subsidy to insurance purchased on Exchanges ‘established by the State,’ we reverse the district court and vacate the IRS’s regulation,” the court said in its ruling. As you can see by the ruling, the politically motivated IRS officials decided to take matters into their own hands and create a rule that directly circumvents the Democrats’ own intention and the words in the law. That ruling was vacated by the court. … [A] separate federal appeals court panel in Richmondunanimously upheld the law and its system of subsidies and tax credits, putting it in opposition to the D.C. appeals court. That could raise the potential of a Supreme Court showdown. “If there is a split in the circuits, then I think the Supreme Court would have to step in,” said Elizabeth Wydra, chief counsel at the liberal Constitutional Accountability Center. Governor Jerry Brown apparently considers himself one part sports medicine geek, medical doctor and football coach. He’s signed a bill to limit the number of full contact football work outs by teenage players in California schools. Assembly Bill 2127, by Assemblyman Ken Cooley, D-Rancho Cordova, prohibits middle school and high school football teams from holding full-contact practices during the off-season and limits them to no more than two full-contact practices per week during the preseason and regular season. 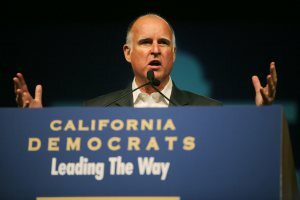 Jerry Brown is now their football coach. The bill by the Democrats is in response to stories about concussions by football players, but it seems to me local school and league officials are closer and better equipped to address medical concerns of local football players. Still, he joins 19 other states in prohibiting full contact football in the off season. By big footing the local league officials, Brown accelerates the left’s apparent desire to kill the game of football. It won’t be long now before high schools will go to touch football only. 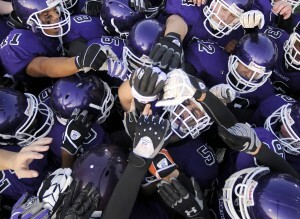 When the reduced preparation for high school football games results in fewer kids wanting to turn out or failing to make a college team, Brown will be among the first to conceive of a bail out plan for their lost dreams. Watch.